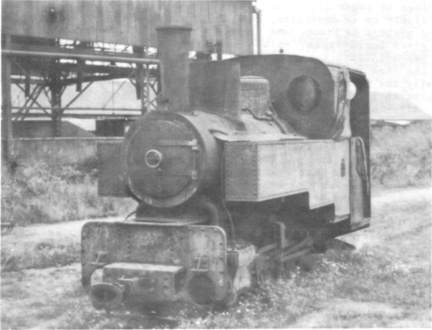 Few industries can have had a wider variety of locomotives than those used in the haulage of sugar (both cane and beet), not perhaps so much in Britain but particularly so in Australia, Fiji and France. Although many of the more interesting systems in France have closed down, there are several still operating which use steam locomotives, mainly narrow gauge. One such system is the Chemin de Fer d’Intérêt Local de Pithiviers a Toury, a 60cm steam tramway which, as its name implies, runs from Pithiviers, a pleasant town in Loiret (incidentally the "twin-town" of Ashby-de-la-Zouch in Leicestershire) for about sixteen miles to Toury, a smaller town on the main line between Paris and Bordeaux. After hearing so many interesting snippets of information about this line George and I decided last year that it was high time we paid a visit. Our journey from Paris (Austerlitz) by the 11.26 a.m. electric was uneventful enough. We arrived at the junction of Etampes at 12.16 p.m. and decided to visit the "Buffet de la Gare" whilst awaiting our connection. The wine was alright, but the sandwich with ham cut thick and the bread tough and unbuttered (later we found this to be a typical French sandwich) was satisfying but not much else. Returning to the station we joined our red-and-cream railcar (with a cupola for the driver) and at 12.41 p.m. we were away on the single track, running between neat fields and a few woods. At 1.39 p.m. we arrived at Pithiviers, a clean and attractive station with the narrow gauge TPT line crossing the forecourt outside. As it was only early September there were no locomotives working and in fact our guide was the only man on duty. It appeared that an employee’s wife had died and most of the TPT staff were paying their respects at her funeral. The TPT has some two dozen locomotives of various types, including American 2−6−2T, British (Hunslet) 4−6−0T and German 0−8−0T as used by both sides on trench tramways during the 1914-1918 War. Other types on the line are 0−6−0T, 0−8−0T, 0−10−0T and Mallets of both 0−4−4−0T and 0−6−6−0T wheel arrangement. Our guide took us into the yard past wagons of many types and sizes and into the workshops where we found some delightful locomotives by Franco-Belge, Orenstein & Koppel and the American Locomotive Company. In an adjacent shed were others of the same types and also a most attractive petrol-electric railbus which was used on the now defunct passenger service. Outside were some withdrawn locomotives by Borsig and Schwartzkopff and other remains which could not be properly identified. After we had taken a number of photographs our guide led us to his personal "voiture" and we were soon away from the town and heading speedily westwards to Toury. We passed over the SNCF line and soon came to a small TPT station at Guigneville which we duly photographed. Later we passed other sections of track, of which much appeared to be out of use, and in about half-an-hour we were approaching the depot at Toury. The shed at Toury is smaller than the one at Pithiviers. Inside it was unfortunately rather too dark for taking photographs of the two locomotives. 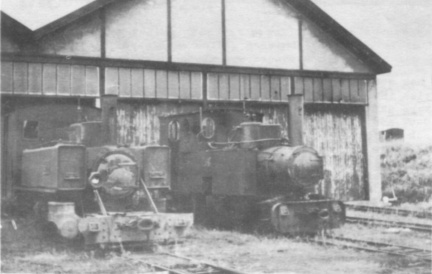 What they lacked in number they more than made up for in interest; one was a Decauville 0−6−6−0T and the other, to my great delight, one of the once numerous Hunslet 4−6−0T described in RECORD No.1. Apart from an extension of the cab roof over the bunker, it was obvious that the Hunslet had suffered no radical changes; we were told that she was in good order. I have always had a strong affection for this design of locomotive and it was the first I had seen although one had worked only three miles from my hone until 1947 – much to my chagrin when I found out! We obtained permission to visit the adjacent premises of the Toury sugar factory and there found no less than eight identical Decauville 0−6−0T. Most, alas, had a woebegone appearance although those inside the shed looked workable. If we had come a month later in October the engines would have been busy and the factory in full production. By this time we were all feeling decidedly thirsty. Hunger had not bothered us unduly although by then it was 5 p.m. We had a little time before our train for Paris was due and sampled some very pleasant Alsace Bière at the inevitable "Buffet de la Gare". Our table overlooked the station where an SNCF diesel was shunting the yard. We were not impressed! For the record . . . . The celebrated motor-racing track at Brooklands was opened on 17th June 1907. As was usual in those days on big construction jobs, steam locomotives were used by the contractors, and six are recorded along with ten steam grabs and one steam digger – all on some seven miles of track. In January 1907, when construction was under way, Price, Wills & Reeves Ltd. were called in to do the concreting and soon took delivery of a new locomotive. BROOKLANDS, a standard class "L" 0−6−0 saddle tank, (Manning, Wardle no.1682), ordered on 23rd January 1907, was despatched to the site on 4th February 1907. Are details known of the other locomotives which worked on this contract? Many speed records have been established here in the past fifty years but the first, to my mind, rests with the contractors. For construction work did not start until the autumn of 1906! "A light engine of the Pelaw Main Collieries ran through the level crossing gates at Wrekenton on Wednesday of last week just a few seconds after a tramcar had passed. Very little damage was done to the runaway engine."